The Advanced Engineering Materials Research Institute (AEMRI) will be a state-of-the-art engineering inspection and validation facility based at TWI Wales in Port Talbot. 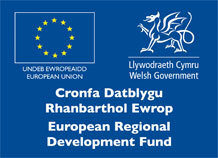 A specialist division of the TWI group, the initiative is being part-funded by the European Regional Development Fund through the Welsh Government, and reinforced with investment through key industry partnerships. AEMRI will build on TWI’s existing track record of leading cutting-edge industrial research in non-destructive testing through industry, government and EU-funded projects to support dynamic sectors including aerospace, automotive, electronics, and nuclear and renewable energy. AEMRI aims to drive business growth and competitiveness for manufacturing and engineering organisations through identified research into advanced engineering and materials. Its technical facilities are scheduled for completion in 2020. Specialising in advanced modelling and simulation, full large-scale mechanical testing and advanced automated non-destructive evaluation for critical flaw detection, AEMRI divides its technical operations into four distinct areas. The AEMRI research environment will combine expertise, equipment and resources for bespoke structural testing and evaluation services designed to determine, test and validate the limits of performance of advanced materials and to find ways of saving time, minimising production costs and reducing the risk of structural failure.